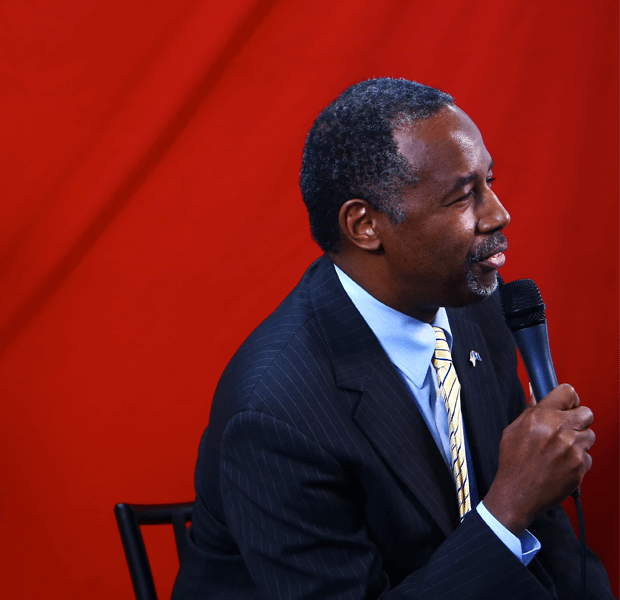 Ben Carson's gun statements have "no relationship with fact"
We talked to Michael Berenbaum about why politicians exploit the Holocaust as a "negative absolute in society," and why Ben Carson's gun comments are "ridiculous." Amid national controversy over gun control, former neurosurgeon and Republican presidential candidate Ben Carson brought casual Holocaust analogies back into headlines last week when he suggested that “gun rights” would have prevented the mass murder of Jews in the Holocaust. It “would have been greatly diminished,” Carson insisted to CNN's Wolf Blitzer when asked about this passage from his new book, A More Perfect Union. German citizens were disarmed by their government in the late 1930s, and by the mid-1940s Hitler’s regime had mercilessly slaughtered six million Jews and numerous others whom they considered inferior … Through a combination of removing guns and disseminating deceitful propaganda, the Nazis were able to carry out their evil intentions with relatively little resistance. It’s a statement that has risen above Carson’s earlier comments about the shootings in Roseburg and his apparent confusion over what the debt ceiling is to become a signature stance of his campaign. Carson supporters and conservative writers have rushed to defend his views on the origins of what is often considered the greatest tragedy in the history of modern civilization. Hopes&Fears talked to Holocaust expert Michael Berenbaum about the Carson's "ridiculous" claims, actual history, and why politicians keep exploiting the Holocaust as a "negative absolute in society." MICHAEL BERENBAUM has written eighteen books on the Holocaust, including Our Crime Was Being Jewish and The Holocaust and History: The Known, The Unknown, the Disputed, and the Reexamined. He was instrumental in the creation of the United States Holocaust Memorial Museum and was the museum’s first project director. He later became the Director of the Museum’s Holocaust Research Institute. Berenbaum is currently the Director of the Sigi Zering Institute at the American Jewish University, which is dedicated to exploring the ethical and religious implications of the Holocaust. HOPES&FEARS: What was your initial response to Carson’s statement? MICHAEL BERENBAUM: The first thing I thought of—the first person I heard that argument from was [right wing para-militarist] Meir Kahane. It was a quote from the 1960s. That’s number one. Number two is, on the face of it, as a historian, that was a ridiculous comment. The armies conquered by the Germans were heavily armed. The army of Poland had arms; these countries all were enormously armed. The effect of the armed resistance was much more psychological than it was practical, in terms of stopping the Nazi forces. I deeply wish politicians of all sorts avoided Holocaust analogies because it shows us how little they know about history. H&F: This isn’t the first time we’ve seen Nazi comparisons made in America. There were also comparisons with Obamacare. MB: Yeah. Well, the Nazi comparisons are inevitable because—and I spoke about this yesterday to children survivors, that’s not children of survivors but people who survived [the Holocaust] as children—we are the victims of our success in terms of Holocaust education. We have established the Holocaust as a negative absolute in society. We don’t know what’s good, we don’t know what’s bad, but we do know that the Holocaust was the Olympics of Evil. When people want to speak about something terrible and want to call attention to it, almost by lack of imagination they make Nazi analogies, whether or not it makes sense. H&F: Some conservatives are pointing out that in 1933, Jews were ordered to surrender their weapons to the police, and eventually Jews were banned from having guns. Did that quicken Hitler’s rise to power? MB: No, it had no impact on Hitler’s rise to power. Hitler’s rise to power came about as democratically as any coalition government. Hitler told people what he was going to do, and that did not seem to hamper him. I put it this way: people supported Hitler not necessarily because he was an anti-Semite, but his anti-Semitism did not serve to restrain them, or give them second thoughts, about voting for Hitler. Hitler then proceeded in a dramatic fashion. To give you an idea, the Reichstag [German parliament] was burned by a Communist in late February 1933. Around two weeks later, martial law was imposed. Proposition 48 of The Weimar Constitution said martial law could only be imposed by two-thirds of those present and voting. Since Hitler did not have a two-thirds majority, he intimidated some of the members of the Reichstag into not coming to vote and others from voting against him. By March, he had established martial law. By late March, he had established concentration camps. By July 14th, the Nazi party was the only legitimate political party in Germany. So if you look at it, within six months he had complete authority. H&F: I’m quoting again from a conservative defense of Carson here, which ends with a question: if you could be transported back in time and assume the role of a Jew in late-1930s Poland, would you rather be disarmed—or would you rather have a gun? Do you think that’s a fair question? MB: Well, let me put it to you this way. The Jews in the Warsaw ghetto desperately sought in 1943 to have arms. When they wanted to mount a resistance in ‘43, their first questions were from where, from who, and how do we get arms. They were desperate for arms. There was no question that the Nazis had put in place policies which would have made use of arms rather punitive. Let’s give a non-Jewish example. In 1942, there was the assassination of Reinhard Heydrich. He was a director of the Gestapo from 1934 through 1939, and at the time he was in charge of the German occupation of what is now known as the Czech Republic. German intelligence linked the assassination to two towns: Lidice and Ležáky. In retaliation, the Germans killed all the men of the towns. They shipped the women and children whom they did not kill off to concentration camps. Now, nobody had taken away the arms of the people of Lidice and Ležáky. They had guns. Some were hunters, some were cops. But guns did not protect them from the overwhelming force of an army that was prepared to kill thousands in retaliation for one. H&F: Is there anything else you’d want to say on Carson’s remarks? MB: Let me say two things on the record. What’s intriguing about all of this is how ahistorical people are being, and how much of what they’re trying to do is about this argument—it’s about guns, so retroactively they read that back into the history. When they do that, those of us who know the history wonder about the nature of how they chose to get that knowledge. It causes us to lose confidence in the nature of the judgments that they make because it shows that they value polemics more than actual knowledge. Therefore, if you agree with Ben Carson’s positions on guns or not—and it’s irrelevant to me if you do or you don’t—his statements on the Nazis and guns have no relationship with historical fact. ON the Cover: Ben Carson addresses the Freedom Summit in Greenville, S.C., May 9, 2015.